Under Clement VI, the fourth of the Avignon Popes, the papal court attracted the best singers of all Europe. Polyphonic music became a magnificent expression of spirituality, but also of political power. The Chapel of the Popes’ Palace is the true place of birth of polyphonic mass, and inspired a great line of tradition for the liturgical use of polyphony. 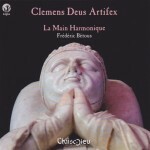 Our programme is named after the Gloria selected for this mass’s reconstitution : the piece is written in motet style, with a tenor above which two superius voices evolve, each with another text – the first one sings the proper Gloria text while the second one unfolds a rather transparent homage to Pope Clement VI, one of the greatest Popes of Avignon. The Order of this mass is made of polyphonic pieces from the Apt and Ivrée manuscripts as edited by G. Gattin and F. Facchin (Polyphonic music of the 14th century), and the Assumption Proper comes from the Notre Dame de Paris manuscript Lat. 9441.